WE CAN HELP PUT AN END TO YOUR MYRTLE BEACH CRAWL SPACE MOISTURE AND HUMIDITY PROBLEMS! Crawl space moisture problems are almost always avoidable. Most commonly, the moisture problems are the product of poor building practices and "cut corners" during construction. The building codes that once supported many of the poor building practices are being phased out as a result of the damage that results. AdvantaClean of Coastal Carolina provides comprehensive moisture control services for the crawl space underneath your Myrtle Beach property. We specialize in temperature, humidity and moisture control under your house so it works with the first floor instead of against it. We repair and upgrade Myrtle Beach crawl spaces of all shapes and sizes. We install vapor barrier systems, crawl space insulation, drainage, sump pumps, and much more! How do I know if I Have a Myrtle Beach Crawl Space Moisture Problem? What Causes Myrtle Beach Crawl Space Moisture Problems? 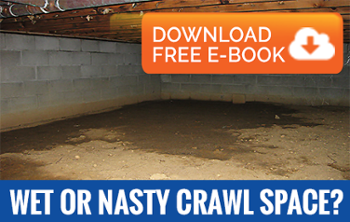 There are four possible sources of crawl space moisture problems. Knowing the source of moisture will help us determine which crawlspace moisture solution is needed to properly eradicate the moisture issue. Ground Water: this crawl space moisture problem is created when water stands or rises in the crawlspace. Water Intrusion: this crawl space moisture issue is caused by the lack of proper grading around the home. Leaking pipes, improperly installed appliance water supplies and water damage can add to the moisture issues in the crawlspace. Dirt Crawl Spaces: The exposed dirt floor in your crawl space grabs the moisture from the air and the moisture from the earth below. The drying of the soil causes the moisture to rise through your home, increasing the indoor relative humidity. High crawl space humidity also creates the perfect environment for mold and mildew growth. Installation of a moisture or vapor barrier can help eliminate this source of crawl space moisture. Poor Crawl Space Ventilation: Poor crawl space ventilation can contribute to the creating a mix of warm and cool air causing surface condensation, further increasing the amount of crawl space moisture under the home.